2008 Phono Preamplifier audio amplifier from Boulder Amplifiers, Inc.
Hi-Fi Amplifier > 2008 Phono Preamplifier > Boulder Amplifiers, Inc. In introducing the 2008 Phono Preamplifier, Boulder sets a new standard for vinyl reproduction of any vintage. It provides ultimate convenience and versatility for the dedicated record lover. The 2008 is equipped with inputs for three turntables. In addition to the standard RIAA, two optional equalization curves are available selectable from the front panel. To obtain the utmost in sonic clarity, the 993 discrete gain module is used exclusively throughout the 2008. The personality card allows convenient change of cartridge loading. The 2008 comes with a separate 2000 power supply. 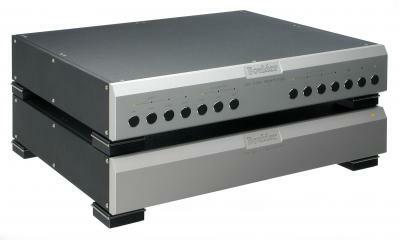 2008 Phono Preamplifier > Boulder Amplifiers, Inc.